Oslo GolfKlubb is the oldest golf club in Norway, dating back to 1924, when founding members laid out a 9-hole course on the southern shores of Lake Bogstad. The original course became a full 18-hole layout eight years later and it has been modified on a number of occasions since then – most notably in 1940, 1949, 1957 and 1975 – with the nines reversed on a couple of occasions. Occupying a compact 120-acre site, the course underwent its most radical transformation between September 2007 and May 2009, under the watchful eye of American architect Steve Forrest. During that period, the equivalent of 4,500 truckloads of sand was imported from Denmark to cap the clay-based fairways, thousands of metres of drainage lines and hundreds of catch basins were installed, all eighteen greens were reconstructed with state of the art subair systems, five hundred trees were removed and the entire property reseeded with bent grass. The result is really quite astonishing, with the old course now converted into an ultra-modern layout that’s well equipped to handle all that the golf world can throw at it in the years ahead. No wonder the mission statement of the club management is to ensure that Oslo golf club is “a fantastic place to be” for its two thousand members. That’s exactly what Bogstad is. 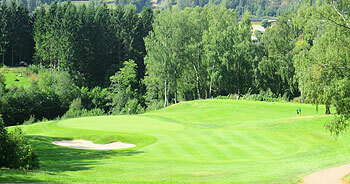 The course is a regular venue for the Norwegian Masters, a Ladies European tour event, and the club has recently established an extensive practice facility which doubles up as an outdoor ice skating rink in the winter. Plans are also currently in place to launch a bid to host the biennial Solheim Cup in 2019 so watch this space for further news. Played Oslo in late July and despite the harsh summer I found it to be in great conditions. Overall this is a strong test of golf but quite fair. There are no trick here as the course demands are quite obvious and if you meet them you can score well. The layout has enough elevation changes to keep you on guard and also some wonderful water views that are worth a picture. Highly worth a visit although the guest green fee is substantial. If you think that Oslo’s course will be a charming, sleepy old track because it dates back almost a hundred years then think again. It may well be Norway’s oldest course (established as a 9-holer in 1924) but it’s also one of the most technologically advanced modern courses in Europe, having undergone an extensive multi million Kroner upgrade in 2008. The fairways are laid out on quite hilly terrain, particularly on the front nine. In fact, I don’t think I’ve ever been on a course before where the opening six holes have had a pronounced “downhill followed by an uphill” pattern repeated three times. The landscape levels out at the short par four 7th, and this was my pick of the holes on the front nine, played to a green that sits on the edge of a little escarpment so that anything mishit to the left of the target (like my approach shot) is dead. The routing for the back nine brings the fairways down to the edge of the lake at holes 13, 14, and 16 with the short par four 14th, (said to be architect Steve Forrest’s favourite) a standout for me. Currently, Oslo lies at number 2 in the Norwegian rankings on this website but I can understand why some may feel that it’s still the national number 1. Such is the popularity of this classy old club, I was astonished to learn that there’s currently a 6-year waiting list for entry to the club as it can only accept around 100 new golfers every season. That statistic alone gives you an indication of how good Oslo is. After the remodelling by Steve Forrest I rate the course at Oslo GolfKlub as Very Good (Eagle) both for layout and general conditioning.